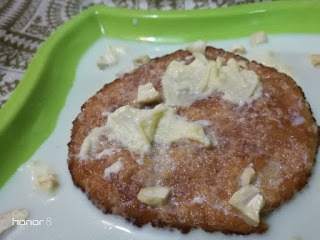 Prathu's Food: Malpua with rabri - Passionate Cooking for Vegeterian Food. First prepare the sugar syrup, place water in a pan over medium flame. Add sugar in it and stir until fully dissolved. Then add 2-3 tsp milk and stir again, after a few minutes remove the scum that rises to the top. Mix maida, rava, khoya, baking powder, fennel seeds, cardamom powder and milk. Ensure that the mixture has a pourable consistency and is not too thick. Once the batter is ready, keep it aside for few minutes so that the flavour of spices and herbs are fully absorbed. Now heat ghee in a pan over low flame. Pour a ladleful of the mixture and spread evenly. Keep the flame low and cook till it is light brown on both sides. Remove the cooked malpua and drain the excess ghee. stir occasionally and get to a boil. also reduce the flame to medium. and once a layer of cream is formed over the milk, stick it to sides of vessel. further, get the milk to boil again. and repeat the gathering of cream to sides of kadai. repeat the process for atleast 5 times or till milk reduces to one-third. also add cardamom powder and saffron milk. give a good mix and get the milk again to boil. also scrape off the collected cream from sides. and give a good stir. transfer to a bowl and let it attain to room temperature. serve garnished with chopped dry fruits or use it to prepare rasmalai. finally serve rabdi / rabri chilled or hot. Its not the click but the taste that really matters. Malpuas are my favorite and love how delicious they taste. Dont worry about the photograph. Trying an authentic dessert from MP is no less a challenge and it does look delicious. I adore Malpuas esp when they are hot from the pan, with all the syrup and rabri on top. Gosh! my mouth waters. Rich and delicious dessert.. We get this in almost every state in the North. Malpua and rabri, prefect pair made for each other.. Who can resist to this incredible sweet. Totally drooling here. A well made recipe is sensed in the way it can be made again by another person. You recip shows such detail and easy to follow. More over for me it is a lovely click, I would love to try this one. Malpua with rabri is such a mouth watering dish. No one can resist these delicious combo. one of our favourite winter desserts! I can just imagine hot malpuas being taken out of ghee and then dropped in the sugar syrup and then liberally dunked in rabri! delicious. superb, malpua with rabri sounds amazing, you made it perfectly with detailed recipe. I am gonna make it soon. it is my love in sweets. very tempting recipe. Wow I am drooling. Malpua with rabri looks delish. Definitely a festive dish Loved your post. Beautiful share. Wow! You dis an amazing job with the the ingredients. This definitely a festive season food. Hey thanks for the shout. Malpua rabri is a heavenly combo ! Perfect festive treat. Lovely share !